Sneezing, runny nose, itching, nasal congestion, heavy breathing, problems with the olfactory senses, secretion down the pharynx, conjunctivitis - these are all unpleasant symptoms of an allergic rhinitis which is most common in the spring. It is an inflammation of the nasal mucosa resulting from the immune response between various inhaled allergens and inflammatory cells in the nasal mucosa. Patients suffering from allergic rhinitis are three times more likely to develop asthma. Some 25-35% of patients with allergic rhinitis suffer from asthma, 85% of patients with asthma suffer from allergic rhinitis, and 50% have been diagnosed with allergic conjunctivitis. Allergic rhinitis can be occasional (lasts less than 4 weeks) or permanent (lasts for more than 4 weeks), mild (without any unpleasant symptoms) or severe (with unpleasant symptoms, poor quality of sleep, decreased quality of life). Most patients also feel tired, which has an adverse effect on everyday activities (productivity, learning, quality of life). Symptoms include runny nose, nasal congestion, sneezing, watering eyes, itching and eye redness (conjunctivitis). The important thing is to determine the allergen causing allergic reactions and to avoid it entirely. In case of pollen, one must follow the pollen calendar and use it to adjust treatment, as well as his or her outdoor activities. The doctor’s orders should be followed not only for symptomatic drugs but also in adopting healthier habits (healthy diet, exercise, regular rest). In case of an allergy to mites and dust found in households, a vacuum cleaner with wet filters is recommended, as well as hypo-allergenic mattresses and pillows. Before leaving the indoor area, it is important to inject an ectoin product into the nose such as the Aqua Maris 4Allergy spray, which coats the nasal mucosa like a filter and prevents the contact of allergens and mucosa. 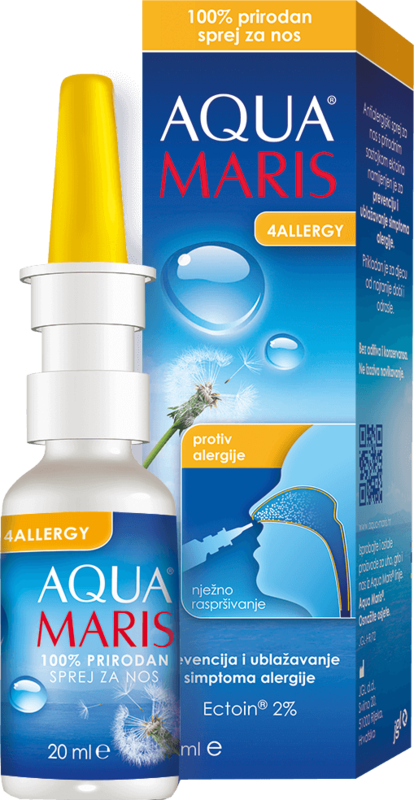 The Aqua Maris 4Allergy nasal spray is a safe and efficient way of relieving symptoms of allergy rhinitis that also supports the regeneration of the nasal mucosa. It is a 100% natural product of clinically proven efficiency, preservatives-free and safe for children and the most sensitive patients! It is available in a handy bottle with a delicate spraying system. Saline solution from the cleanest Adriatic seawater. 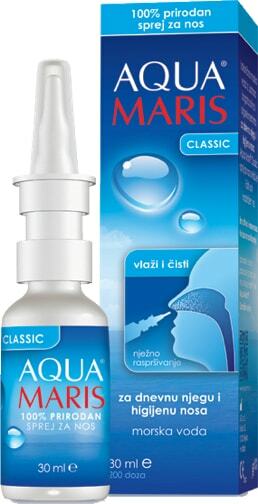 Aqua Maris is intended for daily hygiene and nasal moisturising, for healthy breathing each day and each night. It is available in a handy bottle with a delicate spraying system.